Salesforce delivered a ‘beat and raise’ Q3 2019, sending the stock price up more than 3% in after-hours trading. The only miss was on Q4 2019 earnings guidance. 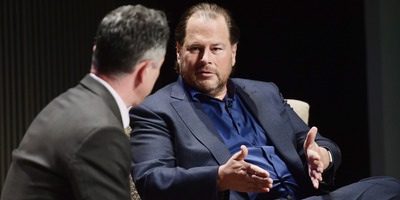 Salesforce also gave its first guidance for revenue in fiscal 2020, when it expects to bring in $US15.9 billion to $US16.0 billion. Salesforce jumped more than 5% after delivering a ‘beat and raise’ in its third-quarter earnings Tuesday. The software giant has struggled through market turmoil in recent months, and fell around 25% from its high in September. But strong third-quarter results, combined with raised revenue guidance for the current fourth quarter, warmed investors to the company. The only miss is Salesforce’s guidance on earnings per share for the fourth quarter, where it came under analysts’ expectations by a couple of cents. Revenue for the quarter (GAAP): Salesforce reported $US3.39 billion, up 26% from the year before. Analysts expected $US3.37 billion. EPS Q3 (adjusted): Salesforce reported $US0.61. Analysts expected $US0.50. Revenue guidance for Q4 (GAAP): Salesforce expects $US3.551 billion to $US3.561 billion. Analysts expected $US3.53 billion. EPS guidance for Q4 (adjusted): Salesforce expects $US0.54 to $US0.55. Analysts expected $US0.57. Revenue guidance for Fiscal Year 2019 (GAAP):Salesforce expects $US13.23 billion to $US13.24 billion. EPS guidance for Fiscal Year 2019 (non-GAAP):Salesforce expects $US2.60 to $US2.61. Revenue guidance for Fiscal Year 2020 (GAAP):Salesforce expects $US15.9 billion to $US16.0 billion.